So, I was going to wall mount my TV. In order to do that, I needed to find a stud. A wall stud, that is. Now most people would tell you that you would need a stud finder, but I didn’t have one. And I wanted to mount the TV NOW. Off to the Google. The Google gave such suggestions as knocking on the wall. Supposedly one could listen to the knocking or tapping and hear the difference between hollow wall and stud. Unless you are part dog, that aint gonna work. The Google also suggested drilling pilot holes. I wasn’t interested in my wall looking like a colander, so I didn’t bother with that one. Then the Google suggested I get a magnet and wrap it in tape and pull it along the wall until the magnet stuck to a nail in the drywall. First, the only magnets I have are Bucky balls. Second, a ball of Bucky balls on a string wasn’t working. But then I realized I only needed one Bucky ball and balancing it on my nail would allow it to stick to any nail. And the Bucky ball stud finder was born. I, like many people, sit at a desk all day. I try my best to sit “properly” and not cause myself injury just by doing my job. You can see in this image (courtesy of the Tuscon Unified School District) what is considered ergonomically correct for sitting at a desk. 90 degree angle in the arm, 90 degree angle in the legs. Forearm and thigh parallel to the floor. That’s fantastic, except for one thing. I have a freakishly short torso. Nature gave me all leg and no body. So if we were to make me into a crash test dummy like in the image above, my forearm is TOUCHING my thigh. No room for a keyboard. So no desk EVER has been ergonomically correct for me, no matter how many keyboard trays or heightened monitors or footstools I try. So, what to do? I decided to try a standing desk. However I never want to *try* anything for several hundred dollars, which is what a lot of the standing desks cost. Then I found this link to instructions for a $22 standing desk. For $22 I could try it and if I hated it, no big deal. The beautiful part of this is that I can just take it off my desk if I don’t feel like using it. However, IKEA is about 1.5 hours drive from here. And I’m lazy. So. I rolled my own. I think that’s worth saving a three-hour roundtrip drive to IKEA. Step 1. Assemble the table. In my case, that meant screwing the four legs onto the table top. Step 2. Measure your table on top of your desk to determine where the shelf brackets should go. Keep in mind the depth of your shelf/tray. Step 3. Screw the brackets onto the table legs. A couple of notes here. You may want to drill a small pilot hole for the screws. If possible with your brackets, avoid being flush up against any of the edges of the legs. Step 4. Attach the brackets. Step 5. Attach the tray. I used a wide and short wipe board, so it was really light-weight and it came with sticky things to attach it to the wall. I used the sticky things to attach it to my brackets. Will this withstand a hurricane? No. Will it work for a stand up desk? Yes. Step 6. Stand back and admire your work. You’re done. And can easily go back to sitting within a couple of minutes. I forgot to note the time for just the desk, but it took me two hours from start of the desk to finishing this blog post. This, my friends, is a tale of woe and despair. 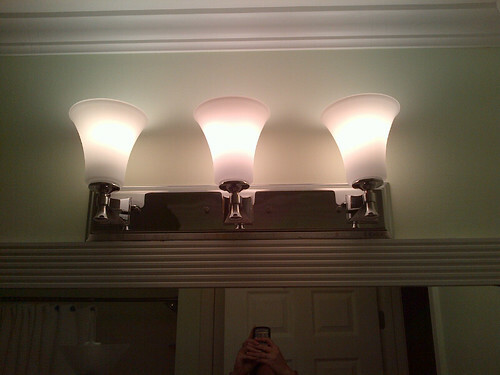 A story about a woman and her nemesis, the dreaded bathroom light fixture. It all began simple enough, as these tales often do. The woman bought a house. A house which may or may not have been built by monkeys. At the very least it was built by incompetent morons and then owned by even more incompetent morons. The woman spent many many hours fixing up the house (you can read some of her earlier frustrations here). It was finally time to re-do the bathroom. A simple job. Paint the ceiling, paint the walls, paint the trim, change out a cabinet, change out a light fixture. The woman had done these tasks several times before in other rooms of the house. No problem, right? So the woman goes to shut off the electric to the BATHROOM. Looks at the electric panel. Shuts off the one labelled “bathroom”. Light is still on. Hmm… She is aided by her lovely daughter and asks, “how about now?” as she shuts off a different breaker. “Still on”. Hmm… she proceeds to shut off each breaker one by one. Finally, the power goes out to the bathroom. Thanks to the breaker labelled “bedroom #1″. OF COURSE. So begins the curse of the bathroom light fixture. Next she removes current light fixture. 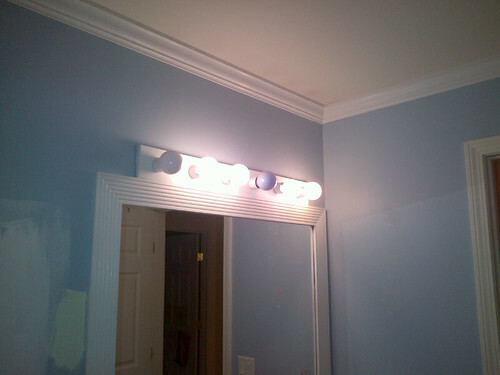 However, the prior (idiot) owners had placed the mirror frame directly touching the light fixture, and then painted them both, effectively bonding the two together for all of eternity. So she pries apart the mirror frame (without ruining it, because she actually planned to keep it) and the light. Having finally broken them apart, she removes the light fixture (by totally destroying it, partly because she had to, and partly because it felt good), only to find the junction box significantly off of center. Why does that matter to the woman? Well, as seen above, the previous light fixture was (ugly) a long wide panel, so it didn’t matter where the junction box was, although one would assume a good builder (*cough* monkey *cough*) would put it center anyway. The new fixture had a (CENTERED) circle plate and branched out. Now the woman could actually see where the electrician BEGAN cutting the hole for the junction box centered, and then decided to move it over (and did a crappy patch job). There was actually a stud in the wall at center, and so he had to move the box over (however, he still loses points for not checking for that first as one can tell by the attempted cuts). This does not thwart our leading lady, she returns her cherished light fixture and finds one with a long wide panel for a back. She moves on with her mission and spends a grueling day priming and painting nearly every paintable surface in the bathroom. Paint dry, room shining like a jewel in the sun, she proceeds to install the new light fixture. Only to find the hole in the back panel of the fixture is a half-inch diameter and no where near the junction box. The woman is faced with a decision. Move the junction box? Or make a new hole in the fixture panel? Either way, she knew she would need supplies, like a great adventurer before a … great adventure. She went to the mega super home buiding supply store place and bought a Dremel. She could cut holes in metal, saw through drywall, leap tall buildings in a single bound! Except she couldn’t. She got home and tried to cut a new hole in the fixture panel. With sparks flying and bad smells emanating, she chickened out. Heartbroken, she backed down from the great beast. But then, like all epic stories, she went to work. Where a co-worker mentioned he had metal punches. He punched a new 1/2″ diameter hole in the fixture panel! Energized by this new twist in her story, she returned home to slay the cursed bathroom light fixture beast. Only to be thwarted yet again. This time by drywall anchors. The instructions said to drill a 1/2″ hole for the mighty anchors. The anchors of course did not fit in a 1/2″ hole. Not to be stopped, she drilled a bigger hole and got the anchor in. Success! Oh no! Only to be thwarted again! When drilling the hole for the other anchor, she hit a wall stud! “The stupid builder must have left a curse upon this room, causing his stupid to spread!”, she thought. 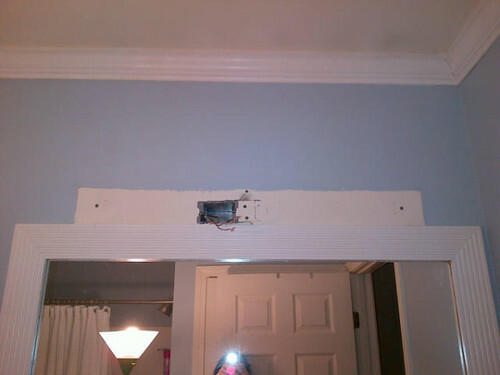 Luckily, she had spare wood screws and managed to finally get the fixture panel attached to the wall. Many of you think (hope) this is the end of our story, but alas it is not. The fair maiden went to put the three glass “shades” on the fixture when CRASH, the box fell to the ground smashing one of the shades to pieces. Our dear heroine was nearly broken. To be so close, and now so far. She called the super mega ginormous home building supply store and asked if she could swap out a glass. Luckily, they were able to help her on her quest. Returning home, once more, in hopes of triumph, she finally, finally completed the fixture installation. * It is NOT upside down. Both the picture on the box, and the instructions clearly stated that this was the proper direction. If you work in a corporate, office-type environment, you possibly have one of those plain grey rectangular trash bins at your desk. You might even have a cleaning crew that comes through your office and empties it, replacing the used bag with a new one. You *may* have noticed a trick they do, which is to store additional bags in the bottom of the bin underneath the current bag. I could do this. I could put extra trash bags in the bottom of the bin in my kitchen and never again get angry when I forget to replace the bag simply because I was too lazy/tired/in the middle of something to walk three feet over to where the bags are stored. Holy crap, I must share this with the world! As some of you may know, I have had to perform a lot of do-it-yourself home improvements in the last few months. I’d like to pass along some of the tips I have learned the hardway, because that’s what I do. When the instructions say they require two people (like when assembling bunk beds from IKEA), it isn’t actually necessary. However, it’s probably easier. Keep all those hex wrenches you get with your IKEA furniture. 1) You’ll need to retighten your furniture later and 2) You can re-use them for other projects (see later tip). When doing electrical projects, it is REALLY worth getting one of those gadgets to see if the power is REALLY off. (See next tip). Electrical panels can be mis-labelled. When painting a ceiling, get good light and someone to help. Even if they’re just there to keep you sane. When purchasing replacement “trim” for your tub/shower faucet handle, check what brand you currently have. Each brand uses its own valve and they are not interchangeable. I call this DRM (decor rights management). Despite research prior to a project, most home improvement projects seem to require 3 trips to a hardware store. Do research ahead of time. If you’re replacing a tub spout, then google “replace tub spout”. You’ll find out there are different types of tub spout and they aren’t interchangeable. Something that isn’t really obvious when you’re at the big home improvement store. (And who knew that hex wrench would come in handy, but it was needed for the “slipon” style tub spout!). Everyone needs power tools. Everyone. Use the right tool for the job. It makes a huge difference. You don’t have to go out and buy every tool out there, but having the right tool makes the job much easier. *I am not in any way saying you can do all home improvement projects and don’t sue me when you electrocute yourself. Do your research and be safe.